Paul Mauser lived in an era of innovation in firearms technology. During his lifetime breechloading cannon and rifles were perfected, the metallic cartridge was invented, the revolver was perfected, smokeless powder was developed, and finally self-loading guns of all kinds were developed. The Mauser company, founded by Paul and his brother Wilhelm, was involved in one way or another in most of these innovations. 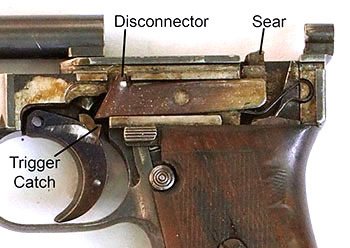 This is the story of the small self-loading pistols developed by Mauser. We are intentionally leaving out the C96 “broomhandle” pistol because so much has already been written about it and this information is readily available. The many experimental pistols developed by Mauser will only be mentioned if necessary to provide historical context, as it is rare for the average collector to encounter one. The backstory of the Mauser company is fascinating but beyond the scope of this article to relate in detail. Readers who are interested should peruse the references below, particularly Paul Mauser: His Life, Company, and Handgun Development, 1838-1914 by Baudino and van Vlimmeren and Mauser Pistolen: Development and Production, 1877-1946 by Weaver, Speed, and Schmid. One brief anecdote may provide some insight. Georg Luger served as a salesman and engineer for Ludwig Loewe & Co., the firm which owned the majority shares in Waffenfabrik Mauser. As a salesman for Mauser rifles, he noticed that some of them had a third locking lug on the bolt. Luger also knew that this was an unpatented feature. So he filed a Gebrauchsmuster or utility model, which is a patent-like intellectual property claim peculiar to the German-speaking countries of Europe. He then sued Mauser for infringing his patent rights. Needless to say, this did not endear him to Paul Mauser. Subsequently, Waffenfabrik Mauser developed the Model 1896 pistol, which for a time was the leading candidate to be the official sidearm of the German military. However, the Model 1896 eventually lost out to Georg Luger’s Parabellum pistol, which was adopted by the German navy in 1904 and the army in 1908, and served the German military well into the middle of the 20th century. In addition, the cartridge Georg Luger designed for the German military, the 9 mm Parabellum, became the most widely-used pistol cartridge in the world, and remains so to this day. By the early 1900’s it had become clear that the Mauser Model 1896, while modestly successful commercially, was not going to become a standard military sidearm, so Waffenfabrik Mauser began experimenting with various new designs, all intended to handle a powerful military cartridge. Once the German military settled on the 9 mm Parabellum cartridge, the Mauser company began to focus its efforts on designing a gun for this cartridge. Eventually the concept of a family of guns, all with the identical design, but scaled in size to handle different cartridges, came into being. The design that eventually emerged is attributed to Josef Nickl, an engineer hired by Mauser in 1904. Baudino and van Vlimmeren state that documents in the Mauser archive indicate that the company worked simultaneously on a design for both the 9 mm Parabellum and the 6.35 mm Browning cartridges. Beginning late in 1907 Paul Mauser began to apply for patents that show a gun with a fixed barrel held in place by a long pin which also serves as the recoil spring guide rod. The gun had no breech locking mechanism, was striker-fired, and had what was described in the English language patent as a pivoting bell crank lever for a sear. The early design, which an internal Mauser document refers to as the Model 1909, incorporates a recoil buffer spring (Rückstoßpufferfeder) to help tame the recoil of the 9 mm Parabellum cartridge. Paul Mauser Archive. M. Baudino Collection. 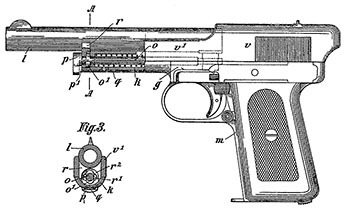 The buffer is not shown in the patents, but it was essentially a flat spring, made with several layers of steel wound and pressed flat, that extended across the front of the slide (or the frame in some pistols). However, the buffer only offered a millimeter or two of compression and proved insufficient to tame the recoil of the powerful 9 mm Parabellum cartridge. The Model 1909 was never a production pistol, but there were a few 6.35 mm pistols made with the recoil buffer spring. One such 6.35 mm pistol, serial number 7, is shown on page 76 of Mauser Pistolen. In the case of the 6.35 mm pistol, the ends of the buffer spring fitted into square holes in each side of the slide. The Model 1909 pistols in 6.35 mm may be regarded as prototypes for the Model 1910. Most Mauser patents were filed in all the major countries of Europe, plus Britain and the U.S. We are only going to list the German and English language patents in this article. German patent 224320 (filed 25 December 1908 and granted 16 July 1910), also British patent 1910-10597 (filed 8 December 1909 and granted 19 May 1910). This patent describes a device to hold the slide open to allow a cartridge to be loaded. The device “is overcome during automatic loading by the rebound force,” but will cause the slide to hold open when retracted by hand. When the cartridge is loaded the slide can then be closed by striking its rear with the flat of the hand. German patent 226069 (filed 24 July 1909 and granted 24 September 1910). This is also a patent for a slide lock mechanism, but this one locks the slide open when the magazine is empty and closes the slide when a new magazine is inserted. This drawing is based on a prototype unlocked breech Model 1909 pistol in 9 mm Parabellum. German patent 215812 (filed 25 December 1908 and granted 4 November 1909), also British patent 1909-28707 and U.S. patent 1043671. This patent covers the design of the barrel and the barrel pin which holds it in place. “According to the invention the arrangement is such that the pin for holding the barrel is parallel with the barrel and passes through two projections on the latter, the projection at the rear of the barrel connecting the latter with the body carrying the barrel, while the other or forward projection serves to lock the barrel holding pin.” Two lugs near the front of the pin lock it behind the front barrel projection. German patent 225891 (filed 11 April 1909 and granted 22 September 1910). This patent describes a safety lever with a lock and release mechanism. British patent 1910-20221 (filed 3 August 1910 and granted 16 March 1911). This patent is an addendum to the above 1910-10596 trigger and sear patent and describes a disconnector that projects from the top of the forward end of the bell crank lever that serves as the sear and connector bar. German patent 231195 (filed 25 July 1909 and granted 15 February 1911), which serves as an addendum to the above 215812 barrel-pin patent. This patent describes a flat spring at the front of the frame which serves to lock the barrel-pin in place, allowing the elimination of the lugs on the pin in the earlier patent. German patent 279890 (filed 20 September 1912 and granted 30 October 1914), also British patent 1913-16381 (filed 16 July 1913 and granted 19 March 1914). This patent describes a mechanism which holds the slide open after the last round is fired and automatically closes the slide when a new magazine is inserted. It also serves as a magazine safety, preventing the gun from firing when the magazine is not fully inserted. Because Waffenfabrik Mauser did not officially designate model names for their early pocket pistols, the guns have been collectively referred to as 1910 model Mausers regardless of caliber. Authors, researchers, and collectors derived further model designations based on the earliest year of significant change in appearance. The initial derived designations were Model 1914 for pistols in .32 cal and Model 1934 for those with the re-designed curved back grip. Model designations could be endless if one were determined to designate every use marking, time period, or unique feature, and so have been restricted to major external design changes. The Mauser company itself did not generally refer to their pocket pistols by model. However, the parts list for the earliest manual was entitled “Mauser-Selbstladepistole M/1910. Kal. 6,35 mm.” Generally, however, the early gun was referred to as the “Mauser Automatic Pistol, Calibre 6,35 mm,” and the later, larger pistol which appeared in 1914 was referred to as the “Mauser Automatic Pistol, Calibre 7,65 mm.” In a 1934 Mauser advertisement the guns were referred to as the “Mauser Selbstlade-Taschen-Pistole Kal. 6,35 mm (9-Lader)” and the “Mauser Selbstlade-Taschen-Pistole Kal. 7.65 mm (8-Lader).” We also note that in an internal memorandum regarding the visit of the Chinese Military Study Commission on 21 June 1910, the 6.35 mm gun is referred to as the Model 1910, and likewise in the ALFA Catalogue of 1911 the 6.35 mm pistol is listed as the Mauser Model 1910. Model 1910 or Side Latch - Type I Model 1910, caliber 6.35 mm. Model 1910/14 or New Model - Type II Model 1910, caliber 6.35 mm. Model 1910/34 - Type III Model 1910, caliber 6.35 mm. Model 1914 - Type I Model 1914, caliber 7.65 mm. Model 1914/34 - Type II Model 1914, caliber 7.65 mm. It is probably a misnomer to designate the Model 1910/1934 as a separate “type,” as it is mechanically identical to the previous type--it is simply another variant of the Type II New Model. Likewise with the Model 1914/1934--it is a variant of the Model 1914--the two being mechanically identical. We have been unable to trace the exact origin of the above nomenclature. In 1946 W.H.B. Smith did not use it, referring simply to the .25 caliber Mauser or the .32 caliber Mauser, nor did E.J. Hoffschmidt in 1957, nor Matthews in 1962. But by the late sixties of the last century it was current in the U.S., and by the eighties it was current in Germany as well. The trigger pin and side latch have been removed and the trigger placed in its normal position. The design is that of a gun with a removable barrel fixed to the frame by a long pin which runs beneath the barrel. The barrel pin, which also serves as a guide rod for the recoil spring, has a small spring at its rear which tensions it and holds it in place in its notch on the underside of the barrel. The plate at the front of the barrel pin has vertical grooves on its front face. The pin extends through the front plate--the rounded protrusion on the front plate is referred to by contemporary collectors as a button face. The gun is striker fired with simple lockwork consisting of a bell crank lever which rotates from its center. The rear of the lever has an upward projection which serves as the sear. Henceforth we will refer to this as the sear lever. The front of the sear lever sits just behind the trigger. When the trigger is pulled, a spring-loaded catch on the rear of the trigger pushes upward on the front of the lever, which rotates, causing the rear portion of the lever to move downward, releasing the striker. The disconnector is an upward projection on the front of the lever that rises into a hollow in the bottom of the slide when the slide is in battery. When the slide is out of battery, the disconnector is pressed down by the slide, forcing the sear upward and preventing the release of the striker. The lockwork is accessed through a side plate on the left side of the gun which is distinguished by a rotating lever just above the trigger which serves as a latch for the side plate, giving the gun its English language nickname, the “Side Latch.” In fact the trigger pin is pegged to the latch and is removed with it, so that the trigger is released and removed at the same time. (This is vaguely reminiscent of the P08 Luger.) It is possible to remove the side plate without removing the barrel or slide, though there are few if any circumstances in which that might need to be done. The latch pin is more than a little difficult to reinstall, due to the trigger spring which tends to push the trigger out of position, and so the side plate should not be removed in the field. The striker has a separate guide rod, the rear portion of which sits in a hole in the back of the frame. When the striker is cocked and ready to fire, the end of the guide rod protrudes through the rear of the frame and can be seen with the eye or felt with the thumb. The manual safety locks the sear by physically blocking it. The safety, when pressed down, is engaged and locked in the down position by flat spring which sits beneath the left grip, to the top of which is attached a button. When the button is pressed, the safety is released and moves upward under spring tension. The spring that tensions the safety lever is a bent flat spring, the bottom arm of which tensions the safety and the upper arm of which tensions the sear. A projection at the rear of the safety arm serves to lock the slide open when the slide is drawn to the rear and the safety applied. The grip is a single piece of wood carved to very closely fit the grip frame, held in place by a screw on either side. The wood grip is scored on either side in a criss-cross diamond pattern--it might be called checkering, but does not have sharp points. In German the description for the grip pattern translates as “fish scale.” Hard rubber grips were also available very early in production. The hard rubber grips are checkered on either side and have a “WM” (Waffenfabrik Mauser) monogram at the top. The slide is open at the top, revealing the front two inches of the barrel, with arms of the slide extending on either side beneath the barrel. The open-top design allows the barrel to be removed when the slide is retracted, without the necessity of removing the slide itself. There is a bullet-shaped ejection port on the right side of the slide. The extractor is a piece of spring steel distinguished in the side latch model by a bottle-neck shape, the rear portion of the piece being narrower than the front. There are nine triangular-cut serrations at the rear of the slide to aid in retraction. The finish is rust blue. A very few side latch pistols have been recorded with a factory nickel finish--these were likely special order guns. The trigger, the end of the barrel retaining rod, extractor, and grip screws are nitrate or fire blue. The front sight is fixed. The rear sight is dovetailed into the slide and drift adjustable. The magazine is of the standard type with the baseplate flush with the bottom of the grip. The magazines are nickeled. Some have a star stamped on the baseplate. Early production magazines have no holes for viewing cartridges, but later guns have eight staggered holes on each side. There is no magazine safety on the side latch pistol--the gun can be fired with the magazine removed. The magazine holds nine cartridges. The serial number is stamped on the left side of the slide at the front, and on the frame at the rear just above the grips. 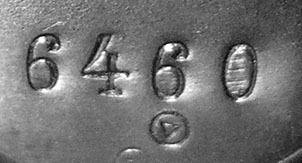 The last three digits of the serial number are also stamped on the front plate of the barrel pin, and on the trigger of a few early examples. The Mauser barrel logo is stamped on the side plate just above the grip, centered between the back of the latch and the rear of the plate. The right side of the slide is blank, except for the vertically stamped crown-over-crown-over-U nitro proof mark at the front. Early examples, up to approximately serial number 2500 have an ejector milled into the frame. The company must have realized it was superfluous, as the compressed striker serves to eject the spent cartridge case, and so it was eliminated to save manufacturing time. The second variant Side Latch has a larger safety release button with circular grooves, about 6 mm in diameter, and is otherwise identical with the first variant guns after serial number 3000. 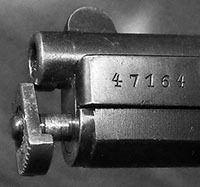 Dealer trademark stamps are sometimes found on the right side where the trigger guard connects to the frame. Remove the magazine and make sure the gun is unloaded. Draw the slide all the way to the rear and engage the safety. This will lock the slide open. Depress the front plate of the barrel pin and turn it to the side. Before you remove the slide completely you may wish to pull the trigger to free the spring-loaded striker from the sear. Carefully draw the slide off the front of the frame. Production of the Side Latch ended in June or July of 1913 and the company spent several months tooling up for production of the New Model, which began late in 1913. The gun was given a major redesign internally, with minor external changes. Today it is referred to by collectors as the Model 1910/14. 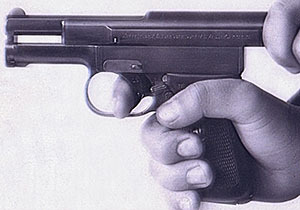 The company began referring to the early side latch pistol as the Standard or Old Model, while the new design was of course called the New Model. Modern usage often refers only to the first variant of the redesigned gun as the New Model, but in reality all guns after 1914 are New Model variants. The barrel pin is retained by a checkered latch on the bottom of the frame, which is attached to the front of a flat spring. The front plate on the barrel pin is no longer grooved on the front, but the sides of its lower lip are grooved. The coil spring at the rear of the barrel pin is eliminated. The barrel pin extends through a hollow guide rod inserted into the recoil spring from the rear. The ejection port on the New Model is slightly shorter and more nearly oval shaped. The extractor is slightly longer and is the same width throughout its length. Internally, there are three major innovations. The first is that the trigger pin is staked to the right side of the frame instead of to the side latch, so removing the side plate does not require removal of the trigger, which considerably simplifies reassembly and makes it less likely that small parts will be lost in the field. The trigger is tensioned by a flat spring instead of a coil spring. The side plate simply lifts up at the rear for removal and requires the slide to be removed from the frame. The second innovation is a redesigned disconnector. The sear lever no longer has an upward projection at its front end to serve as a disconnector. 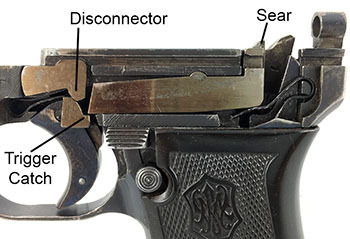 Instead, there is a second lever in the frame just over the trigger which depresses the spring-loaded catch on the back of the trigger whenever the slide is out of battery, preventing the catch from engaging the sear lever. The early disconnector levers are milled and have a pin on the back that fits into a hole in the frame. Also, instead of turning on a pin staked into the frame, the milled sear lever itself has a shallow pin on its back side which fits into a hole in the frame. Why the disconnector design was changed is not clear. The third innovation is described in German patent 279890 (see above) and is comprised of a new magazine follower design, a magazine safety, and a mechanism that holds the slide open when the magazine is withdrawn and closes it when a magazine is inserted. The mechanism is a roughly triangular-shaped piece of metal, the bottom point of which is rounded, which pivots on a pin. The forward corner of the mechanism is pushed upward when a magazine is inserted, and the rear corner rises upward under spring pressure as the magazine is withdrawn. The mechanism is tensioned by an upward extension of the magazine release spring. When the last round in a magazine is fired, the rear of the magazine follower rises up to lock the slide open. As the magazine is withdrawn, the rear corner of the slide lock moves upward into a recess in the base of the slide, holding it open. At the same time a portion of the mechanism moves in such a way that it locks the the sear. When a magazine is inserted, the rear corner of the mechanism moves downward, releasing the slide, and the sear lever is freed. If the magazine is empty, the closing slide simply rides over the magazine follower and closes the breech. If the magazine is loaded, the closing slide chambers the first cartridge. One last minor change: The striker is redesigned to have an integral guide rod. The small hole at the rear of the frame is enlarged. It is now much easier to visually distinguish when the gun is cocked because the end of the guide rod only appears when the striker is locked behind the sear. This change eliminates the separate guide rod and the small spring at its end. There are several variants of the New Model . This is the variant most often referred to as the New Model, though in reality all subsequent guns are technically New Models as well. This variant was made between 1914 and 1919, with at least two sub-variants. The first variant New Model looks very much like an Old Model with no side latch, retaining the nine triangular-cut slide serrations and the address on the left side of the slide in all-capital sans-serif characters (like the third variant Side Latch). The latch-less side plate has the Mauser powder barrel logo centered on it. The front sight is notched instead of half -moon shaped. The barrel pin no longer protrudes through the front plate (i.e., the front plate is flat), which has no grooves on the front. However, there are two grooves on the side of the lip which projects beneath the frame. The first and largest sub-variant (from approximately serial number 60500 to 107000) has the crown-over-crown-over-U proof mark stamped vertically on the right side of the slide, just behind the muzzle. The right side of the slide remains blank except for the proof mark. The second sub-variant (from approximately serial number 107000 to 115000 has the crown-over-crown-over-U proof mark stamped horizontally on the right side of the slide, just behind the muzzle. Within this sub-variant, intermittently, will be found guns with no banner on the sideplate and barrels with a band around them at the front sight. Minor variations in the slide address are also documented. Beginning at about serial number 112000 the checkered latch for the barrel pin is eliminated and the flat spring that tensions it becomes more narrow and is curved into a rounded shape at its end which fits into a slot on the bottom lip of the front plate. Circled triangle, rear of frame, unknown meaning. There are very few known examples of Mauser 1910 pistols in the serial number ranges from 115000 to 150000 and from 156000 to 200000. These gaps may be from stopping production of the 6.35 mm (.25 cal) model during the war because of greater demand for the 7.65 mm (.32 cal) model. World War I ended on 11 November 1918. 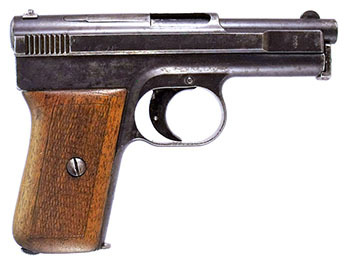 After the war, in 1919, Mauser began a redesign of the New Model pistol. In the interim between 1919 and 1921, some guns were made that may be classified as late first variants, some were made that may be classified as early second variants, and some guns were made that may be classified as hybrids of the two. We must leave it up to the individual owner or collector to make this determination. The use of existing parts at the end of the war to continue production in the post war economy may explain why many minor differences are encountered in this period. These differences include side plates with and without a Mauser banner, slides with different styles of address stampings, milled or stamped magazine and barrel retaining rod catches, milled or stamped other small internal parts, one and two part strikers, barrels with and without barrel bands, and smooth or button faced barrel retaining rods. The method of stamping serial numbers also varied, with some early examples having the complete serial number stamped on the rear of the frame, and some with partial frame serial enumeration of either three or four digits. It is likely that production and assembly of the second variant started before all parts for the first variant had been assembled. To prevent the older parts from being wasted they were most likely assembled concurrently in separate batches. Serial numbers were assigned sequentially regardless of features of the batch. This is the largest contiguous serial number range for any variant of the Model 1910, and as a result we refer to it as the Standard Model. Pender refers to it as the “post-war commercial model .” This variant was made from approximately 1921 through 1928. The primary external changes are a stepped grip frame, a redesigned magazine release, new slide serrations, and a new slide inscription on the left side in all capital sans-serif italic characters as follows. WAFFENFABRIK MAUSER A.-G. OBERNDORF A.N. Most side plates have the Mauser powder barrel logo centered on them, but we continue to see intermittent side plates that are blank. Slightly larger logos are also found, probably indicating that a new roll stamp had been cut. The magazine release is redesigned to reduce costs and speed manufacture--the flat steel is formed into a curved release and then tempered, so that the spring and the release are contiguous. No milling is necessary--this is referred to as a stamped release. A new style of slide serrations appears: seven broad flat-bottomed plunge-milled serrations. Production of other parts is simplified in this period. The safety lever is stamped instead of milled . The shallow pin on the back of the disconnector lever is eliminated, so this part also can be stamped. A minor change is made to the frame to accommodate the redesigned disconnector. Front plates on the barrel pin vary between smooth-faced and “button-faced” (i.e., with the pin protruding through the plate, some with grooved sides and some without. Beginning around serial number 256100 round half-moon front sights begin to appear again. Some have barrel bands and some do not. The guns continue to have a rust blue finish. The trigger, barrel retaining rod, extractor, and grip screws are nitrate or fire blued. The grip is either checkered wood or hard rubber with a WM monogram. The magazines bodies have a bright “in the white” finish with three vertical slots in the left side. The magazine base has a square front with an indent in lower serial numbers and a notched base in higher serial numbers. The notch in the base allows the magazine spring to retain the base on the magazine tube. Magazine bottoms are finished in a nitrate blue. Some magazines are marked with the Mauser banner, either acid etched, or stamped on the tube or the base. Intertwined WM, rear of frame, unknown meaning. In his book Mauser Pocket Pistols, 1910-1946, Roy G. Pender III displays three guns, and lists a number of others by serial number, which he labels as “Portuguese 1910.” He apparently gave them this designation based on a small triangle in a circle stamp at the rear of the frame. Similar stamps were used on Luger Parabellum pistols purchased under contract by Portugal, and Pender must have assumed this indicated that the Mausers were also purchased by Portugal. Unfortunately, there is no further evidence to back this up. In subsequent years a great deal of information has been published from the Mauser archive (now under the custodianship of Mauro Baudino), information preserved by August Weiss and others, but there is no reference in this material to a contract with Portugal for Mauser 1910 pistols. Of course, we cannot prove a negative, and we cannot say that the pistols were never sold in Portugal. Certainly there were various Mauser dealers that would have been capable of signing and filling a contract with Portugal, but until positive evidence for a Portuguese contract is located we must reserve judgment on the issue. We estimate that approximately 58,300 where made with these features. Many changes occurred in this serial number range. The method of stamping serial numbers varied within this model from external to internal, beginning around serial number 376400. Partial serial enumeration on all except the slide serial number is seen, with either 2, 3, or 4 digits being used. Early examples continue to have a rust blue finish, but this was changed to salt blue around serial number 370000. Sometime between 370000 and 390000, Mauser began to stamp serrations on the bottom of the magazine release. The grip continues to be either checkered wood or hard rubber with an MW monogram. The magazine body has a bright unblued finish with three witness slots in each side. The magazine base has a square-front notched base in lower serial numbers and a square-front, clipped toed, notched base in higher serial numbers. Magazine bottoms are finished in blue. Most magazines are stamped with the Mauser banner on the base. Intertwined HD, rear of frame, unknown meaning. Austrian proofs and police markings. 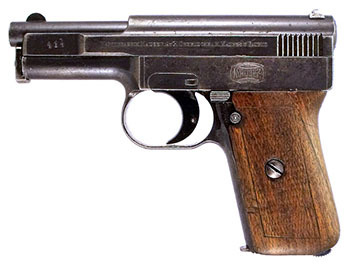 This variant is what modern collectors refer to as the Model 1910/34. Pender refers to it as the 1910/34 Commercial. It probably did not appear in 6.35 mm until 1936, despite its established name, but the 7.65 mm version was in production by early 1934, which is certainly where the name arose. The 1910/34 is distinguished by its ergonomic grip with the curved back, but is otherwise virtually identical with the previous variant. 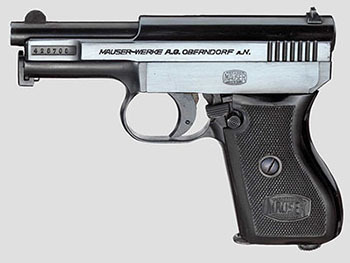 The new grip is said by Wirnsberger to have been designed by August Weiss, who came over to Mauser-Werke from DWM in 1930 and was appointed as manager of pistol production. Darrin Weaver suggests that the new grip shape was taken from the Nickl pistol that became the CZ-27. In any case, Weiss felt that Mauser’s pocket pistols were a bit dated and in need of a facelift, so he certainly oversaw the gun’s reworked appearance. To give the gun a cleaner look, partial serial numbers were no longer stamped on the back of the frame or on the bottom of the sideplate. The frame serial number was moved to the left side beneath the grip, and the sideplate serial number was moved to the back side of the plate. The front plate of the barrel pin is perfectly smooth, with no grooves on the front or side. The finish is a high-polish salt blue. A few guns are known to have been nickel plated, and some have mixed nickel and blue parts. The curved one-piece grip is either walnut with light checkering, or black plastic. The plastic grip (sometimes said to be hard rubber or bakelite) is a new design with the Mauser powder barrel logo at the bottom on a checkered field. Early magazine bodies are rust blued and have three slots for viewing cartridges. Later magazines are salt blued and may have nine round holes in the side for viewing cartridges. Magazines have a notched base with the Mauser banner and most will feature a round-front base, though some retain the earlier square-front base. There are three minor sub-variants, the first having no milled slot for the serial number (serial numbers 401800-423000) and the second having the milled slot (serial numbers 423000-429000). Finally, very late examples, after approximately serial number 428000, have the eagle over N nitro proof mark. The eagle over N proof was used beginning early in 1940. Production is believed to have continued at least through 1939, and possibly into 1940. GERMANY, or MADE IN GERMANY, indicating they were intended for export from Germany.